For a while now, Jacked Factory has been getting a lot of attention on Amazon. While their original pre workout Altius used to get all the spotlight, now their leaner and meaner Nitrosurge is taking up the center stage. What really separates Nitrosurge from Altius, is that for a lesser price Nitrosurge targets exactly what you need to increase your energy before working out. From there, you can consider Nitrosurge Shred if you would like added weight loss support. But is Nitrosurge really what you’re looking for? 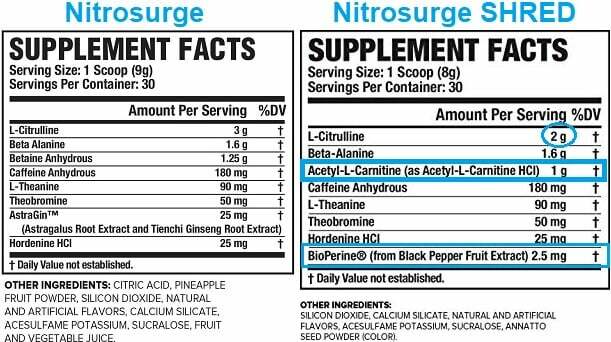 Here is our full Nitrosurge review along with how this pre workout stacks up to Jacked Factory’s own Altius, Pumpsurge, and of course Shred version of Nitrosurge. Ingredient Facts: What’s in Nitrosurge? Todays ‘key ingredient’ for increasing nitric oxide. The only downside, is that the recommended dosage for straight l-citrulline is 6 grams – which means a double-scoop of Nitrosurge to get the needed quantity. Easily the most famous pre workout ingredient. Beta-alanine is the reason why your skin tingles/itches/burns after taking a pre workout supplement. Though, to truly benefit from beta-alanine you will want upwards of 3.2 grams. So again, a double-scoop would be ideal. Betaine is a less publicized pre workout ingredient, and can also be found in recovery formulas. This is because betaine isn’t necessarily time-sensitive, but rather works to improve performance and body composition when taken consistently over weeks. As the trend goes with l-citrulline and beta-alanine, the single-serving 1.25 is indeed only half of what current research suggests you need. You can learn a lot about a company based on the stimulants they use, and corresponding dosages. Jacked Factory uses an ethical 180 mg of caffeine anhydrous in Nitrosurge, which is a reasonable dosage. If you choose to take two scoops in order to maximize l-citrulline, beta-alanine, and betaine quantities – then you will be amped up on 360 mg of caffeine which is ‘super-stim’ territory. L-theanine is single-handedly our favorite ingredient to accompany caffeine in pre workout, fat burning, and general energy supplements. Why? Because l-theanine ‘takes the edge off’. Meaning, l-theanine reduces the less-wanted side effects of caffeine like: rapid heart rate, anxiety, and crashing. Jacked Factory chooses a 2:1 caffeine-to-l-theanine dosage. This is typical of the supplement industry, however we prefer when the ratio is flipped 1:2 for an optimal experience. While originating from the coffee bean (and chocolate) like caffeine, theobromine isn’t actually a central nervous system stimulant. Rather, it aids energy in other ways less clear. Current research suggests theobromine to essentially elicit a 1/10 power of caffeine energy effect, while also effecting heart rate, and having ‘negative effects’ in dosages exceeding 250 mg (1). From what we have found, AstraGin is a blend of Astragalus root and Ginseng that is intended to improve the uptake of other ingredients. Essentially, AstraGin is made to mimic black pepper. Hordenine is a stimulant commonly used in pre workout and fat burning supplements. It offers a unique energy experience, especially when combined with caffeine. Clearly, the Nitrosurge formula is very straight forward. What is less clear though, is that to get the dosages touted on Nitrosurge’s front label you must take 2 servings, not one. This is a common advertising practice in the supplement industry. 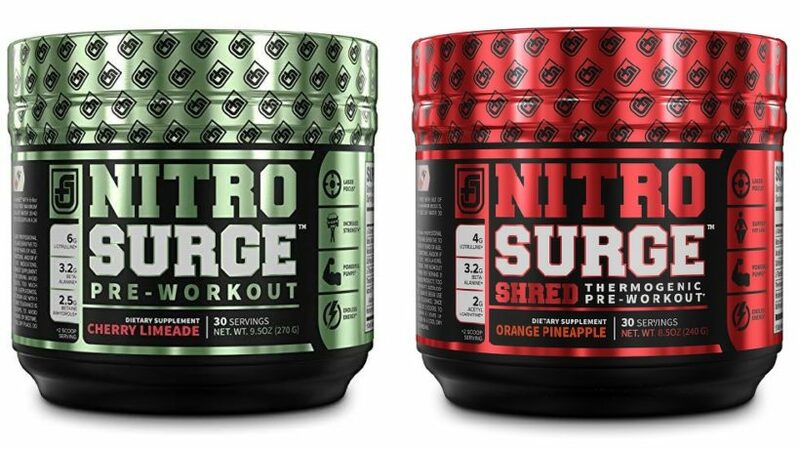 Nitrosurge Shred is slightly more expensive than the standard Nitrosurge, so what else are you getting? And that’s all. Nothing major honestly. So are you going to burn excess amounts of calories thanks to the 1 gram addition of acetyl-l-carnitine? I wouldn’t bet the farm on it, but it is like having a sliver of RSP QuadraLean included in your pre workout. What exactly is Jacked Factory’s Pumpsurge? While browsing Jacked Factory supplements, you likely also came across Pumpsurge. 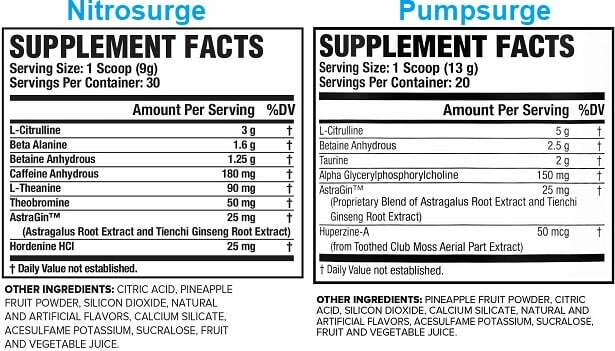 This is their stimulant-free pre workout, and it contains a similar formula to Nitrosurge, with a few additions and without the caffeine. Like Nitrosurge, Pumpsurge is a relatively bare-boned and straight forward formulated supplement. Overall, Jacked Factory produces very economical and straight-forward pre workouts. Yes, Nitrosurge Shred is a bit of a let-down. But, the standard Nitrosurge is a solid ‘hit and lift’ pre workout, while Pumpsurge will give you added nitric oxide on caffeine-free days. Compared to other pre workouts, Nitrosurge is a valid contender against mainstream giants like C4, new Jack3d, and Anarchy. However, formula-first products like Greg Gallagher’s Kino Octane pull ahead. If you’d like to try Nitrosurge, go for it. We didn’t experience or find any red flags while taking any of these Jacked Factory supplements.